Looking for a throw on dress that can take you anywhere? 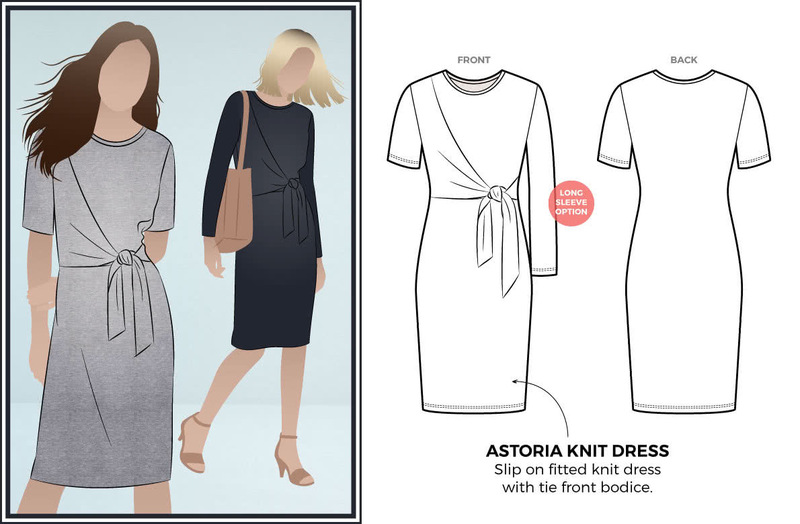 If the answer is yes, then our new Astoria Knit Dress pattern is the dress for you. Not only is Astoria an easy and quick sew, there are no zips, buttons, or linings required – so all you need is your knit fabric, some 6 mm elastic and you’re off! This pattern is available in all of our formats: paper single-size, paper multi-size, PDF single size and PDF multi-size. We have given you the option of a sleeve for those who want to wear it in the cooler months with a pair of tights and boots. Or perhaps you are heading into warmer days and you choose to make it with the short sleeve and pop on your favourite pair of sandals for stroll down the street. Equally Astoria looks the part on a dinner date with great friends with your favourite clutch and heels. This versatile pattern looks great for so many everyday occasions, you can see why we say it can take you anywhere! The cleverly designed tie front creates a cinched waistline that is a nice touch for this otherwise simple pull on shape.